Six months ago the Chasing Ice team sat down to reflect on the “life” of our film. Over the last year and a half, the film has screened thousands of times around the world shifting the opinion of skeptics by revealing tangible and visible consequences of climate change. However, our nation is still in debate over the link between human activities and observed climate-change trends. Our team strongly feels it is no longer acceptable for our political leaders to deny the scientific reality. 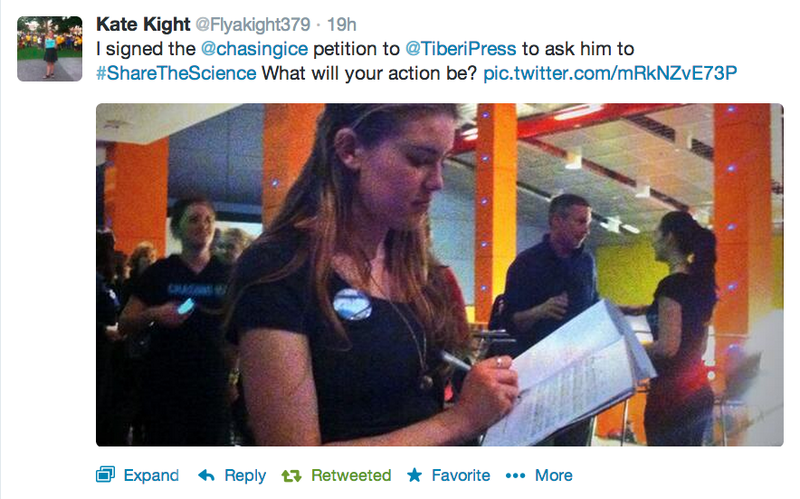 We believe that Chasing Ice presents an opportunity to end the political debate on man-made climate change. The Chasing Ice Ohio Tour became our pilot study to see if a specific strategy using the film could substantially shift the national conversation around climate change and potentially end the political debate. Our team understood that to properly address climate change, our political leaders in Washington need to stop debating about whether or not climate change is actually happening so that they can take action. But those leaders are in a tough position. They’re concerned that if they change their stance on climate change, they might lose votes and ultimately lose their job, something that has happened to other Congressmen. Our strategy was to take the film to one specific congressional district in Central Ohio, represented by GOP Representative Congressman Pat Tiberi. 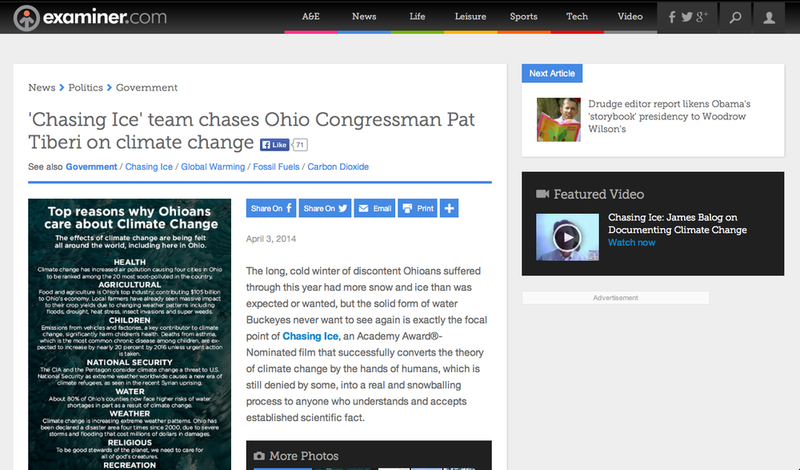 Congressman Tiberi was listed as a climate change denier by Obama's Organizing for Action (OFA). By saturating his district with Chasing Ice screening events, press and climate education for the public, our goal was to support the Congressman through his constituents, and provide him with everything he needed to understand and embrace climate-change science. Our new Chasing Ice screening events focused on a simple platform for district residents to reach out to Congressman Tiberi and ask him for his statement on climate change. All we asked was for the public to share their voice, and to allow us to post their message to the web. Timeline- Our team spent three months in the Boulder office developing the tour which included: writing proposals, researching Congressmen and congressional districts, developing educational language, creating a new constituent call to action, building a new website and designing marketing and media materials. We then traveled to central Ohio and were based there for two and half months where we accomplished the following tasks: booked screening events, built local strategic partnerships throughout the district with over 70 local groups, developed press and media connections, held meetings with the Congressman and continued to develop the call to action in order to support the Congressman. In response to meeting directly with Congressman Tiberi and his staff, we developed and launched a new website to share the voices of local residents and address questions and concerns to the Congressman: www.DearCongressmanTiberi.com. 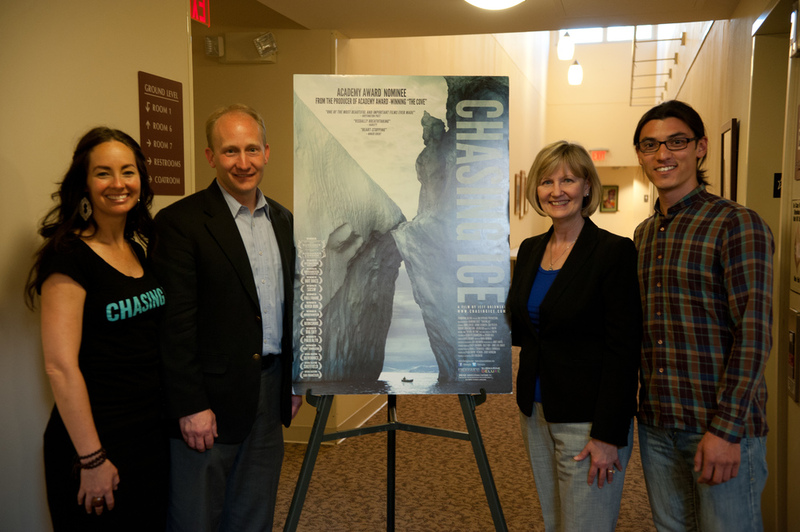 The Chasing Ice team hosted 91 screening presentations. 8,035 Ohio residents attended screening events. Our marketing and networking events reached another 1,405 people. In total we interacted with 9,440 Ohio residents. We collected over 300 photos of Ohio residents' messages to Congressman Tiberi. Over 35 press articles or event announcements were released about the Ohio Tour between April-May 2014. Our team built partnerships with over 70 local venues/organizations, as well as 8 national collaborators. These organizations represent a wide range of concerned citizens including representatives from many different faith-based organizations, 6 high schools and 7 universities, 4 rural and urban farming organizations, 7 art and cultural venues, and 41 various other local libraries, communities spaces and organizations. Our team distributed 6,000 copies of the Chasing Ice DVD that accompanied a written call-to-action specifically created for Ohio residents. The last round of DVDs created featured additional footage, including a personal introduction from Jeff Orlowski, as well as a video call-to-action encouraging the public to share their voice with Congressman Tiberi directly. 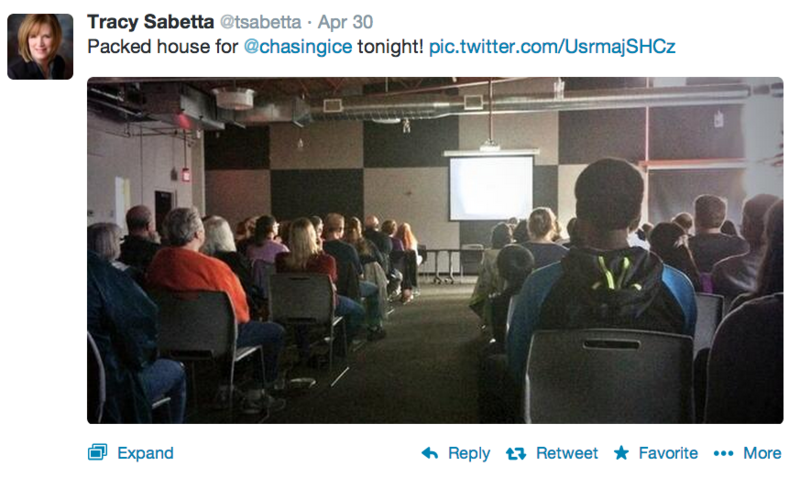 662 Ohio residents signed up to stay involved with Chasing Ice Ohio Tour. Throughout the Ohio Tour the team worked to create a huge buzz in central Ohio. Below are some examples of articles, Facebook and Twitter posts that were in support of the movement we were working to build in Congressman Tiberi's District. Early on during our tour, we had an opportunity to meet with the Congressman directly as well as with his staff in DC. During these meetings we outlined the purpose of the tour, and the fact that we were requesting the Congressman publicly acknowledge the reality of climate change. His team was extremely attentive, and they were very aware of the fact that our tour revolved around Congressman Tiberi. They were surprised—to say the least—to see the Congressman's name all over our marketing materials. All of our energy and focus was put into asking the public to reach out to Congressman Tiberi. Yet a few weeks into the tour, we received a phone call from a local Commissioner's office, Paula Brooks. The staffer asked us what we were up to, as countless people in the district were telling them about Chasing Ice and about our tour. If the Commissioner's office was getting huge requests like this, we could only imagine what the Congressman's office was dealing with. Halfway during our tour, the latest IPCC report was released. President Obama's non-profit, Organizing for Action, amassed a team of volunteers to go to the office of every Congressman who denied climate change. They brought the IPCC report, and asked the Congressman's team for a statement. The Chasing Ice Team is thrilled to see this forward movement. Our political advisors and collaborators have expressed that they believe that this updated stance from Congressman Tiberi is directly related with our work in his district. The only thing that separated any other Congressman from Tiberi was our Chasing Ice Ohio tour. Although our team is no longer based in central Ohio, we are continuing to support all of our 70+ local collaborators to host screenings all throughout summer and beyond. The team is currently planning a collaborative meeting between Congressman Tiberi and 15-20 local organizations to provide an opportunity for them to open up the dialogue on climate change. Our new website www.DearCongressmanTiberi.com will serve as a resource for the Congressman and his constituents. The site highlights information on climate change and specific impacts in Ohio as well as potential energy alternatives and solutions in the Midwest. A personal video message for the Congressman is featured explaining the science and consensus behind climate change. In addition, a Dear Congressman Tiberi Facebook group provides a platform for continued conversations about climate change between constituents. 1. More People Now Claim To Have At Least Some Knowledge About Climate Change. How much, if anything, do you happen to know about the issues of climate change? 2. Climate change acceptance increased, particularly among republicans, nonwhites and college grads. Do you think climate change is happening? Are glaciers worldwide melting & becoming smaller, advancing & becoming larger, or has there been little or no change in size of glaciers worldwide? 4. Belief in human causes of climate change grew overall, and especially among those who saw Chasing Ice. Assuming that climate change is happening, do you think it is caused mostly by human activities, caused mostly by human activities, caused mostly by natural changes in the environment or cause by both human activities and natural changes? 5. Belief in scientific consensus grew significantly, notably among Chasing Ice viewers, Republicans and younger voters. Do you think that most scientist agree climate change is real and already happening, or do you think scientists are about evenly divided on whether climate change is real? 6. A large minority express strong personal concern about climate change as intensity increased. How important is the issue of climate change to you personally? 7. The number of voters who would support a candidate they disagree with on climate change views decreased. Lets say you agreed with a particular condidate on most issues and were of the same political party, however, that candidate voted against efforts to reduce the threat of climate change. Would you be likely to vote for or against that candidate? Our team is now back in Boulder evaluating the life of the tour and the future opportunities we may have to continue this strategy or develop new strategies in other congressional districts across the nation. The Chasing Ice team believes the use of film and story telling provides a powerful tool to address the disconnect between citizens and their political leaders and we hope to continue to explore impact strategies for social change. The Chasing Ice Ohio Tour would not have been possible without the generous support of the Kendeda Fund, the Cornfield Family, and the Wild Foundation. Our team is extremely appreciative for this opportunity and support from all who contributed their time, energy and resources into this project.